Russian secret services will work in partnership with UK intelligence services to ensure security during 2014 Sochi Olympics. 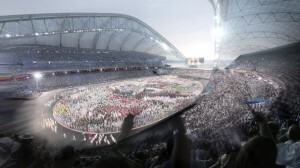 The decision was taken during the recent visit of the UK prime minister David Cameron to Sochi. “We want the Sochi games to be secure and calm,” Mr Cameron said. The prime minister proposed the move noting that over 50 British companies are participating in the Sochi projects – from construction to energy supply. “Therefore, President Putin and I have agreed that there should be limited cooperation between our security services for the Olympics,” Mr Cameron said. His statement comes as a sign of improving relations between Russia and UK, and was welcomed by Moscow. “The engagement between the special services was interrupted at the initiative of the British side, but we are pleased to see the willingness to cooperate for the sake of having a secure and safe Olympics in Sochi,” Putin’s spokesman, Dmitry Peskov said. Security cooperation between the states had been interrupted in 2006 following the “alleged” poisoning of Alexander Litvinenko in London. The UK then demanded Russia to extradite the prime suspect Andrei Lugovoi, but Moscow refused.